Hamiltonian paths are rarely encountered in video games compared to "shortest path" algorithms like A*. This is partly because the Hamiltonian paths problem is notoriously difficult, but mostly because there haven't been enough open source projects, libraries or tutorials on the subject. This is a real shame since many genres of games could be designed around the use of Hamiltonian paths. Diagram 1: Super Chains, co-developed by your truly. Find the longest chain of bubbles sharing the same color. Hamiltonian paths present a search problem that is considered "NP-hard". Some really sophisticated research has gone into this problem, so please consider this humble tutorial as a brief introduction. Imagine a regular 8x8 chessboard. 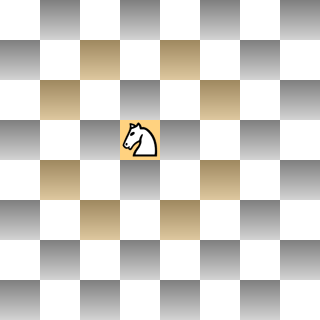 Can you traverse every square on the board using only the knight piece? Here is the catch: you are only allowed to visit each square once! It takes exactly 63 moves to solve the puzzle and if you manage to do it, then you have found one possible "Hamiltonian path". Note that if you can finish the Knight's tour one move away from the initial square where you started then you have completed what is called a "Hamiltonian cycle". 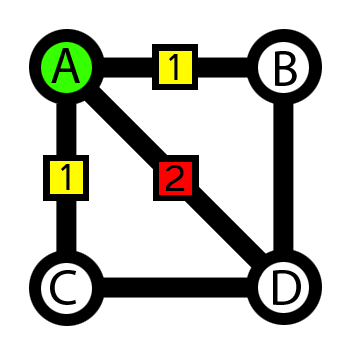 Diagram 2: Knight piece with eight possible moves highlighted in yellow. The graph is represented in Lua as a table where: 1.each key is a node and 2.each value is a table containing the neighboring nodes. Next, we are going to build a graph representing the chessboard. 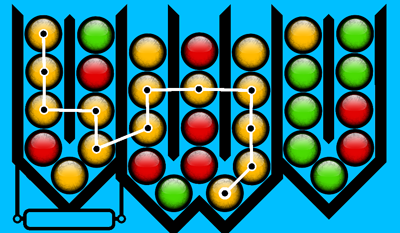 Each node or square on the board will be labeled with a number (from 1 to 64 for an 8x8 board). To connect the nodes, we need a way to find all the legal knight moves for any given square. The following example uses a method called "mailboxing". Mailboxing adds a few rows of padding and allows us to eliminate invalid moves, so that our poor knight can't jump off the board! If you have any chess knowledge at all, you could probably come up with a different approach of generating the graph. We know for a fact that the Knight's tour problem can be solved with 63 moves. 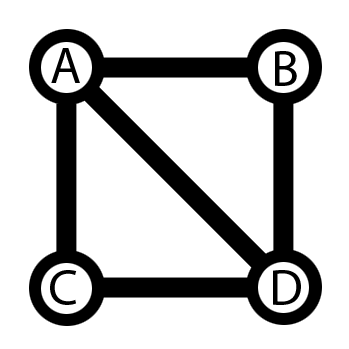 If we include the starting square that's a path of 64 squares. This value is important, because it serves as an upper bound while searching for a solution. OK, though guy... you recently upgraded your CPU and think you can plow through the Hamiltonian path problem in no time. The bad news is that that there are estimated 4x1051 possible move sequences and the valid solutions are quite rare. Now that you have an idea of the enormous size of the search space, it should be clear that using "brute force" is clearly not an option. While there are linear-time algorithms for solving the Knight's tour, this is not the case for more complicated types of graphs. Nevertheless, mathematicians have discovered a few clever tricks. Warnsdorf's rule suggest that when searching the graph, we should seek the nodes that have the fewest non-visited neighbors. Let's look at a concrete example. 1. 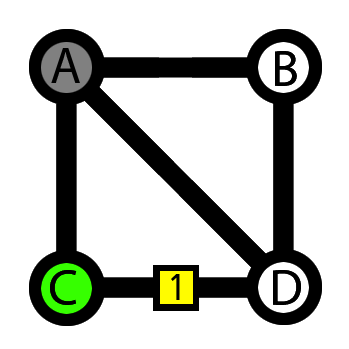 Graph of four nodes (A,B,C and D) and five edges, traversal begins from node A. 2. 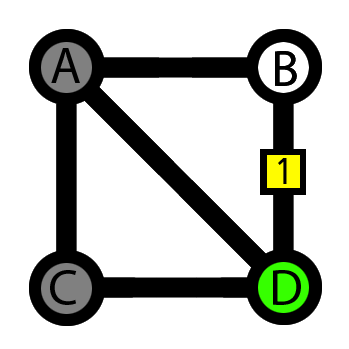 Node A: There are three possible choices (B,C and D). Two of the choices (B and C) have fewer non-visited neighbors compared to the third choice (D). According to Warnsdorf, choices B and C must be considered before D.
Warnsdorf's rule is good for simple graphs like our chessboard, but it may not always work. In many cases, following the rule is not enough to find a solution. Therefore, our code needs to perform some backtracking. 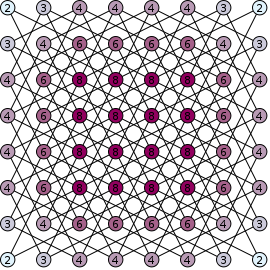 Note that with the Knight's tour problem we can start the search from any square, but for other types of graphs some starting nodes could be eliminated. I would like to end this tutorial by saying that the code provided here is far from perfect. The methods we have considered are just slightly more advanced than using brute force, but the difference in speed is significant. The tutorial code could probably handle most small graphs in less than a second, but imagine what may be possible with more sophisticated techniques! More importantly, I hope to have encouraged you to learn about graph theory. Thanks for reading and have a nice day.